Rebecca over at Lost in Books hosts this new (and absolutely fun!) meme, The Book List. Click here to see Rebecca's post this week. This week's topic is 3 Fiction Worlds I Would Like to Hang Out In. This one was super easy for me, and I have put them in order of my desire . . .
Hogwarts: Well duh! Being that The Harry Potter Series is one of my all-time favorites, this was an absolute given! Oh, how I would love to personally see a game of Quidditch, walk the trails of the Forbidden Forest, have a little butter beer down the way at the Hog's Head, visit the Herbology lab, have a chat with Hagrid . . . really I could go on and on. I think I've made my point! Alagaesia: Inspired by my own home state, Montana, Paolini's world is one that has everything you could ask for. In case you are not familiar with this world, it comes from The Inheritance Cycle, or what may be better known as Eragon, Eldest, and Brisinger. The final installment that has yet to be released cannot come soon enough! Narnia: From the classic of Lewis' The Chronicles of Narnia, I am enchanted with not only the world, but the characters themselves. Seriously, who would not like a friend like Tumnus or the Beaver family, or of course, Aslan himself?!? Can you see a pattern here? I think I like those big towering mountains with sloping valleys, snow-capped peaks, and beautiful horizons! I'm a complete mountain girl at heart and living in the Midwest, I think I tend to be attracted to the beauty that reminds me of "home"! Where would you like to hang out? I would like to hang out in Narnia. I didn't put it on my list though. What a fun list! I'm still thinking about mine. I agree with your list completely! Or at very least Hogwarts being first on the list! Pam . 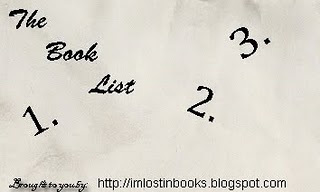 . . You had Inkheart on your list and that would have been my #4 I think! Emma Michaels . . . Of course!! 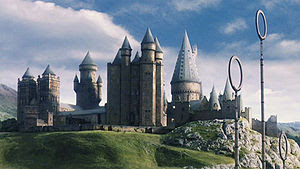 Hogwarts would simply be too fun not to! I love your selections, Tif! I didn't know you were originally from Montana, so that is a fun new fact to learn about you! Thanks for participating!